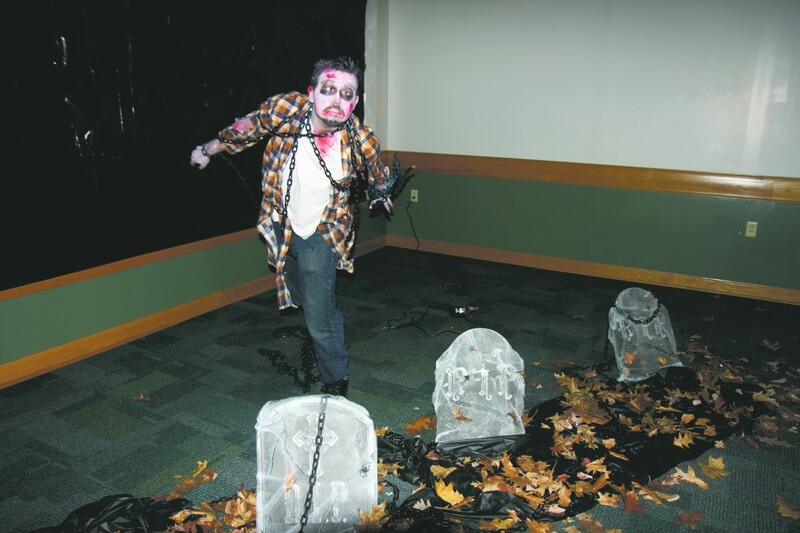 This year, Halloween terror began at College-in-the-Woods’ Mohawk Hall. More than 300 students attended the dorm’s first-ever haunted house and left with slight heart palpitations. Perhaps one of the biggest resident assistant events this campus has ever seen, the Mohawk haunted house took students for a spooky adventure filled with cobwebs, eerie music and, oh yeah, zombies too. In groups of three to five, students timidly entered. First, they were greeted by two blood-covered Dr. Frankenstein characters ready to put their next victim on the slab. Quickly making an escape and running at the sound of evil laughs, they entered a dark, smoky space with an extravagant coffin. But don’t get too close — the corpse jolts to life. Live actors from the Dickinson Community Players brought back the undead, dressing up as a man in a shredded suit with a flower sticking out of his mouth and a girl in a white gown and ghostly face makeup. At first they were unassuming, but once they got up and started following you, things got scary. When you’re being chased by zombies in the dark and the low static buzz of televisions fills your ears, the only thing you want to do is run. Under the leadership of Mohawk RAs Gabriel Valencia, Lisa Knoph and Traci Rubin, this was one of BU’s most popular Halloween events. Valencia, a sophomore double-majoring in French and biology, was ecstatic over the turnout. Eyliza Morciglio, a junior majoring in neuroscience, was blown away by the Mohawk RAs’ hard work. Morciglio went in with her group of friends, including Brittnay Crocco, a senior majoring in mathematics. Crocco agreed that the haunted house definitely delivered the scares. If you were one of the many who survived Mohawk’s haunted house, you are lucky. Now, however, you must prepare for the weekend, where you’ll likely see drunk Mileys and Sandra Bullocks in spacesuits everywhere you turn. What could possibly be scarier? Happy Halloween!